Quick Background : Since 1948 Gitman Brothers have created the world’s highest quality, custom, off-the-rack shirts since their founding in Ashland, Pennsylvania. The problem was that their website and online presence reflected none of this, and the search engines barely ranked them for their own name! 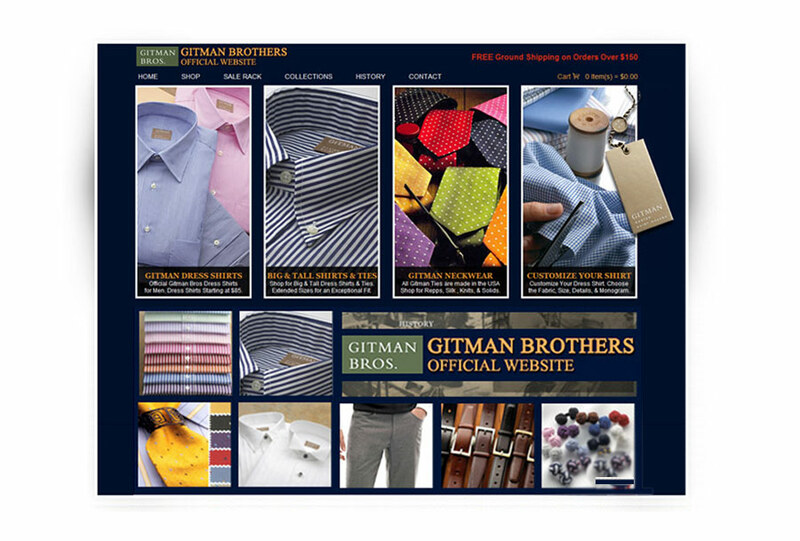 Take a high quality company like Gitman Brothers Master Shirt Makers and have their website reflect their brand and status correctly. With our SEO and search engine placement programs in place, many Customers’ introduction to Gitman Bros. would now be the official website, and we needed that first impression to count. Then, once Customers showed up, the site must elegantly show them the products and the checkout line so those Customers could order the Gitman Shirts they wanted quickly and efficiently. The ultimate goal was to greatly increase recurring corporate revenue through e-commerce sales of their entire product line, including the powerful ‘Big and Tall’ division. What they needed now was to maintain the dignity and status of the company through a clear voice and design on their new website. Sales were important, but equally so were image and brand integrity. We had to make it clear that this was the New official Gitman website, not another of the many reseller websites that competed with the company for the sale of their own shirts. Redesigned the website to change it from an online brochure to a branded highly functional E-Commerce platform with fully integrated Shopping Cart/ordering system. Stayed true to the Gitman Master Shirt Makers brand and style guide, while modernizing the site feel. Simplified the ‘Find a Product’ functionality with a much easier check-out functionality. Increasing functionality with the advent of ‘Clearance’ and ‘Big and Tall’ sections in a more visible way. Built the new website and design on a purpose built professional E-Commerce platform. Integrated Email Marketing and Order fulfillment functionalities with the Shopping Cart. Redesigned the checkout pages to lower ‘abandoned shopping cart’ rates. Applied Best Practices Search Engine Optimization. Applied the GOiMarketing Tool Kit for increased exposure. Adoption of Google priorities such as Video Marketing and Canon Tags. Incorporated online timed Press Releases into the SEO plan. Created thousands of Keywords to highlight their entire product line online. Optimized and Planned Press Releases. Press Releases will highlight new seasonal products throughout the year. Creating Business Videos to support the website online through the years. Mission Accomplished! The growth of traffic and sales to the website has exceeded everyone’s expectations. Even though the GOiMarketing strategies have recently begun, the rising sales and traffic charts show the future to be bright. Sales have more than doubled in the first six months of the program and continue to grow and drive additional revenue. The website is attractive, dynamic and powerful. The shopping cart is well integrated. All programs are tied together and supportive of each other. The internet marketing practices and Search Engine Optimization programs have proven very successful to traffic and more importantly, revenue.